Another fine day for the last match of the Five Arches season. After the downpours on Saturday the Whitland green was spongy but played well. The matches between the two teams are historically hard fought and close and it was important for the Arches that we gained the six points we needed to make sure of second place in the league. On rink 1 , Lee aided by Cameron, John and Ray were up against home captain Ashley. At tea it looked as thought the local knowledge was going to pay off as the Borderers foursome led by 12 shots to 4. Lee and his rink are made of stern stuff and won eight ends in a row to run out worthy winners by 25 shots to 13. A remarkable turnaround from the Five Arches quartet. Rink 2 saw Ken taking on skipping duties for the first time this season. Ably supported by Eamonn, Ken and Ben they had a explosive start leading by 16 shots to 2 after 8 ends. A brief wobble in the middle ends allowed the Borderers a glimmer of hope but this was quickly snuffed out and Ken and his team pulled away to record a 29 shots to 18 victory. Ashley and his rink of Dai, Tony and Gwyn enjoyed their afternoon on rink 3. A fortuitous 7 helped them to a comfortable 17-5 tea time lead and after refreshment they continued to build and eventually surged to a 30 shots to 11 victory. Tony and his rink of Ben, Mike and Clive had a tight old tussle of rink 1. Leading by 11 shots to 7 at tea the game was finely balanced. But the Arches rinks' mixture of youth and experience paid off and they held on to win by 17 shots to 15. A wonderful way to finish the season claiming all 14 points and confirming second place. I would like to thank everybody who has played for the Five Arches this year, it's been a pleasure being captain and perhaps next year we can push on and go one better. After last week's defeat, the Five Arches needed to win this encounter at Sutton Street to maintain their push for second place in Division 2. Going into the game the Mariners were one point ahead of us so a victory was essential. Once again we were blessed with stunning sunshine and battle commenced in ideal circumstances. On rink 2 in front of the rowdy Sunday afternoon crowd, Ashley and his rink of Ken, replacing the sidelined Dai Rees, Tony and Gwyn had a storming start, 16 shots to nil after 4 ends and 20 shots to 4 at tea. The Mariners quartet played extremely well after tea however the earlier deficit was always too much to pull back and the Five Arches foursome eased to a comfortable 29 - 14 win. Rink 3, proving as treacherous as ever, saw Roy and his rink of Eamonn, Ken and Ben up against the wily Graham Bann. The Mariners rink had a strong start and led by 12 shots to 2 at tea. A rally saw the Five Arches team win 6 of the remaining 11 ends but eventually succumbed to a 23 to 13 defeat. Lee and his rink of Stuart, John and Ray were hoping to continue their winning ways of the previous week and this proved to be the case. A comfortable 12 shots to 3 at tea, they carried on out scoring their opponents to run out winners by 25 shots to 9. Biggest win of the day was on rink 5, Tony and his rink of Clive, John and Carruthers winning Captain Dai Spencer, had a cautious start, 5-1 down after five ends, they scored 17 shots in the next five to lead by 18 shots to 5 at tea. An equally good second half saw them pull away to a handsome 28 - 11 victory. Overall a good victory to finish off our games at home. Next up is the last game of the season away to the Borderers at Whitland. We need to obtain 6 points to be mathematically assured of second place so another good performance is desirable. Finally many congratulations to Pendine for winning the Division 2 championship. As mentioned in last weeks report, following the conclusion of the Gold Cup Tournament , Tenby faced formidable opposition in the Afan Valley side, Glyncorrwg, in their bid to retain the Carruthers Shield. With home advantage and the manner of the win against Pontrydyfen making Tenby favourites, the Afan Valley side enjoyed their roll of under dogs and proved throughout the match that they did not travel to Tenby just to make up the numbers. After 1 end, the match was 6-5 to Tenby and all looked to be going well until the ‘Corrwg turned up the heat on an already hot afternoon. After 5 ends Pat Currie was 8-1 and Phil Carpenter was 11-0 down. Paul Diment and Craig Guymer tried to steady the ship and both lead 7-2 and 5-3 respectively. A lead of 11 shots to the away side this early in the game did not bode well and the large Sutton Street crowd were silenced by the scattering of away supporters who were now, even though still early in the match, sensing victory. Paul Diment’s rink continued to surge away, and at 10 ends led by 13-4. Craig Guymer also extended his lead against Welsh International and Current British Isles Champion, Ross Tomlinson by 10-5. 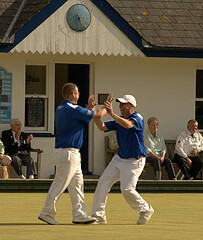 Phil Carpenter was still struggling against John Tomlinson but had reduced the deficit to 13-6. It was however on rink 1 where all was changing in Tenby’s favour, with John Roberts playing superbly to help the rink to trial by the 1 shot. At 10 ends, Tenby found themselves 6 shots ahead and had outscored their opponents by 17 shots between ends 5 to 10. The question on everyone’s minds was whether Tenby would further press home their advantage or would Glyncorrwg find the spirit to pull the game around in their favour? At the 15 end mark Paul Diment, with Joe Richards and Peter Day playing some great bowls, further extended their lead to 14 shots (20-6); Craig Guymer with his brother also playing at the top of his game were beginning to demoralise Ross Tomlinson by continuing to convert opportunities set up by Luke Rees and Mike Jackson, and now led by 18 shots to 5. Phil Carpenter continued to keep things tight and was behind by 5 (15-10) and the Pat Currie revival continued to now level the game at 15-15. With Tenby now having a lead of 22 shots with only 24 playing ends remaining (6 ends by 4 rinks), it was now their game to lose. Paul Diment continued to forge ahead taking a 4, 3 and a 2 over the closing 6 ends to record a final winning scoreline of 29-11. Craig Guymer finished winning 4 out of the last 6 ends to record a very impressive 24-8 victory over the talented Ross Tomlinson. Phil Carpenter’s four tried their best to close the gap but in the end had to settle for a 5 shot defeat, which after 7 ends, when 13-0 down, would have been more than welcome. Credit to the rink for their fighting spirit. Pat Currie had also come back level at 15 ends, but a dropped 5 on the 16th end, followed by losing 3 out of the last 5 ends, saw them fall away to a 7 shot defeat. Therefore a win of 22 shots (85-63) to the Welsh Champions, in a match kindly sponsored by Betfred. Tenby will now travel to Llandridod Wells, the Welsh Bowling Association Headquarters, in 2 weeks time to face Ferndale from Mid Glamorgan in the semi finals, which will be held at 9.30am. If a win is achieved, they will then play either Porthcawl or Dinas Powis at 2pm that afternoon. The team would like to take this opportunity to thank the Club and in particular, Lynn Deli, for her co-operation with regard to ensuring that the match could be played due to her taking the effort to reschedule the Gold Cup. 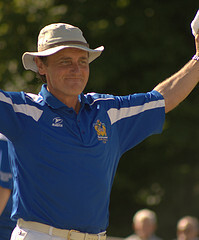 Finally, congratulations to Phil Carpenter on winning his third Silver Bowl and to John Roberts and Craig Guymer on reaching the semi-finals of Gold Cup and Silver Bowl respectively. After a lengthy break since our last game, almost three weeks, we travelled to Haverfordwest to take on St Thomas. Although the League title is beyond us, it was important to do well in the last three games to secure second place. Unfortunately we were denied one of our players shortly before we had to travel and therefore had to play with only fifteen. The games against St Thomas are traditionally close, only six shots separated the teams at the beginning of the season. On rink 2 Roy, supported by Ken, Ken and Joe who stepped in to help us out after his Carruthers triumph the day before, were involved in a tight game until the 15th end. With the game evenly balanced the St Thomas quartet forged ahead winning 5 of the last 6 ends to run out winners by 25 to 14. Rink 3 saw Tony and his triple of Mike and Clive up against a tricky rink and an "on fire" Peter Jenkins again the game was evenly poised until the 16th end where a loss of 6 shots proved decisive and the St Thomas pulled away to win by 23 shots to 8. Ashley and his rink of Dai, Tony and Gwyn were hoping to continue their winning ways from previous weeks, however a slow start saw them down by 10 shots to 3 down after 8 ends. A fine comeback was mounted winning 10 of the remaining 13 ends, they overwhelmed their opponents and eased to a 23-13 win. Lee, ably supported by the returning Stuart, John and Ray had an explosive start, 11-1 up after 7 ends. In an evenly matched second half the St Thomas foursome fought back well and almost clinched the game on the final end, however Lee and his rink hung on to record a 20-19 victory. Another disappointing result for the Five Arches but with the next game on Sunday against the Pembroke Dock Mariners, which in effect will be a playoff for second place, all is not yet lost.